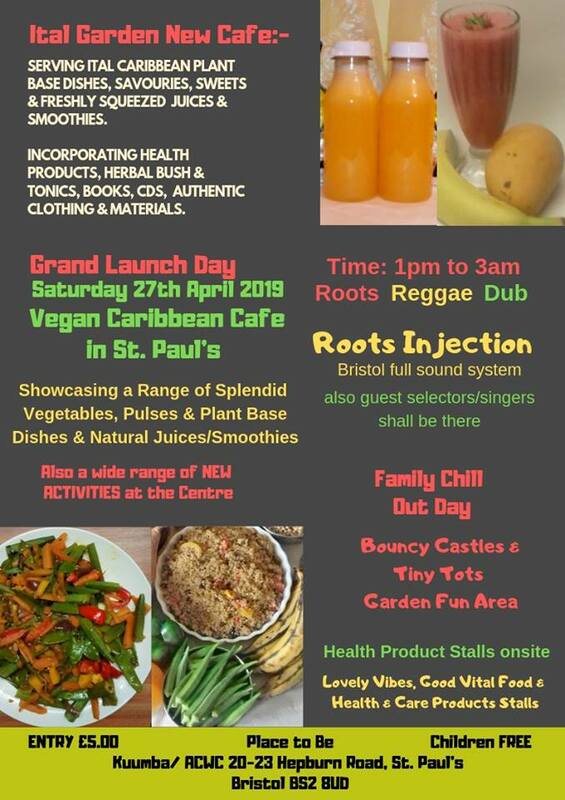 Ital Garden Vegan Caribbean Cafe Launch Event. Here is the full details of what will be taking place on the day. Ital Garden will be promoting it Vegan Caribbean Cafe, Health, Educational and Other Products thru Collective working. Also provide a space in a Culturally stimulating environment for small groups of people to meet, read books or watch Educational DVDs. We will be serving dish after dish of different plant base vegetables, pulses, spice dishes, grains and Caribbean ground food. Plus desserts and Natural squeezed vegetables and fruit juices such as: Ginger, Lime, Oranges,Cucumber, Kale, Hibiscus, chuh!! too much to mention. We have Herbal Remedies Bushes and Tonic drinks also.